I’ve said it before, and I’m sure I’ll say it again at some point, but I love to send text messages. I don’t know what it is about it, but there’s just something fun about sending digital messages and not having to talk on the phone (or use a messenger pigeon) to get a message across. For the most part, texting on my iPhone is a pretty good experience. And, with some of the changes Apple made with iOS 7, it’s smarter than ever. But that doesn’t mean there isn’t any room for improvement. As all of us know by now, there’s usually always room for that. 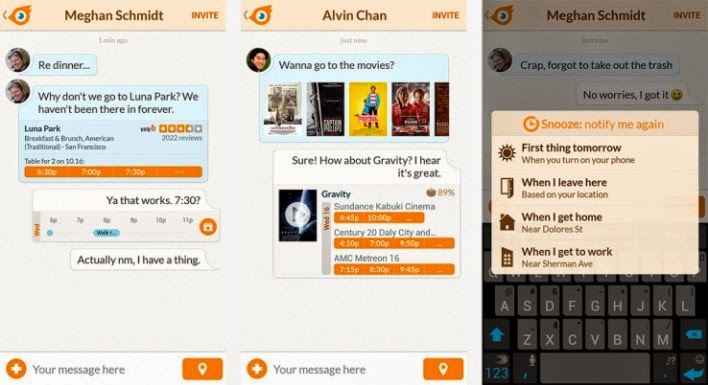 Emu is a new app available in the app store that promises to make texting smarter and easier at the same time. Just how does it propose to do it? Admittedly, it’s a pretty simple and straightforward idea – they want to make it so you never have to leave the text message to get other information. Here’s what I mean by all of that: imagine you’re texting a friend about going to see a certain movie but you don’t know what theaters are showing it or at what time(s). Emu, knowing you’re researching a certain movie, will automatically figure out what theatre is playing it closest to you and will show you the showtimes – all without you having to leave the app to use another app. It also does the same thing with restaurants, and will even pull up Yelp reviews for you to peruse before you decide to try out a new eatery. Also, scheduling appointments is a breeze – you can do it right from the text message. Emu also has other smart features, such as automatic-reply texting when it knows you’re driving down the road. You can read about all of Emu’s exciting features here. As of right now, Emu is a free app for iOS users. It’s unknown if it will come to Android in the future. The only bummer about Emu? Both you and the person you’re texting need to have the app.